The Main Idea #1: The Emancipation Proclamation freed slaves in Confederate states. The Main Idea #2: African American participated in the war in a variety of ways. The Main Idea #3: President Lincoln faced opposition to the war. The Main Idea #4: Life was difficult for soldiers and civilians alike. The Big Idea: The lives of many African Americans were affected by the Civil War. ​-> Students will summarize the main points of the Emancipation Proclamation. -> Students will analyze the qualifications of Abraham Lincoln after his first term as president. Log onto Peardeck to take the notes for Section 4. Life for a Soldier at War. Abraham Lincoln’s ChildhoodThis page provides a detailed description of Lincoln’s childhood in Kentucky and Indiana. The Middle YearsThis section includes a three-page series on Lincoln’s early jobs, move to Springfield, marriage, and blossoming law practice. Election of 1860This section details the controversial and unprecedented Election of 1860 and Lincoln’s unlikely ascent to the President of the United States. Lincoln’s CabinetThis section includes mini-biographies on Lincoln’s cabinet members. Learn all about Seward, Chase, and Stanton, and other interesting characters from Lincoln’s political circles. Mary ToddThis page provides a detailed biography on the mercurial First Lady, Mary Todd Lincoln. Emancipation ProclamationLearn all about this landmark law that ensured slavery would cease to exist in the United States forever more. Gettysburg AddressThis page is dedicated to Lincoln’s famous Gettysburg Address, the greatest speech in American history. Did you know Lincoln’s address came after the two hour-long speech of Harvard professor Edward Everett? AssassinationThis section tells all about the fascinating and tragic tale of Booth’s assassination of President Lincoln. Did you know Lincoln’s death was part of a larger plan to destroy the top officials of the Union government? Lincoln’s LegacyThis page describes and highlights Lincoln’s lasting effect on America and illustrates the inumerable ways he’s been honored throughout the country. Abraham Lincoln Animated BookThis is a fun, animated book for kids about the life and times of Abraham Lincoln. Lincoln Interactive MapThis interactive map details the important geographical places of Abraham Lincoln’s life. 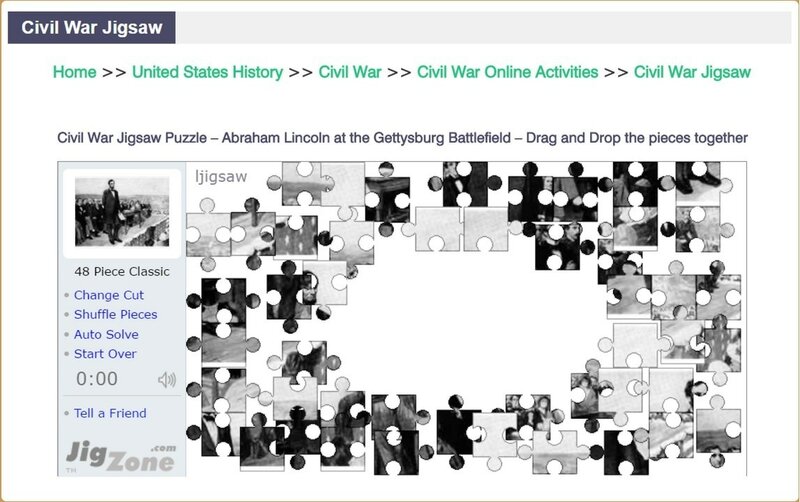 Online Lincoln ActivitiesThis page features a variety of Lincoln-themed and Civil War-themed online activities such as reading comprehensio exercises, paralaughs, cloze reading exercises, word searches and much more. Civil WarSimply the most extensive Civil War section for kids on the internet. Clip ArtThis page contains a range of different Abraham Lincoln images within the public domain that you can use for your own websites or blogs. PresidentsThis section includes biographies of all 44 presidents, vice-presidents, first ladies, and much more. Tons of activities! Directions: Abraham Lincoln has just decided to run for reelection for the President of the United States of America. He has asked you to write him a letter of recommendation that he will show the people of the United States as to why he would be an excellent choice to be the next president. Make sure to highlight all of his skills, attributes and achievements that he has made up until 1865 so the American people will want to elect him as their next president. Good luck! Click on the picture to learn more about people of the Civil War. Try to complete the crossword puzzle. Try to complete the jigsaw puzzle.